Easter is coming early this year and to be honest it's totally thrown me off. I'm normally quite organised but seem to find myself chasing my tail at the moment. As with all things Easter the first thought that springs to mind is chocolate eggs but chocolate isn't always suitable for everyone. 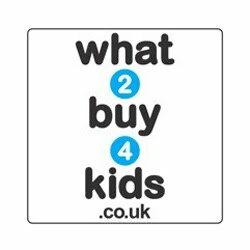 There could be various reasons for this from age, allergies or you just don't like it so why not be different this Easter and get your little one something unusual to celebrate the holiday. I See Me! are a fab company providing personalised story books of all shapes and styles. Here's a little bit about them in their own words: "Kids love being the stars of their very own stories, so just imagine their delight when they discover that their new storybook has a very familiar hero. Personalised storybooks from I See Me! make children feel special while encouraging important skills such as reading, letter recognition, and learning to spell their own names. Beautifully illustrated and professionally bound, customised books from I See Me! take quality and personalisation to the next level." Harlow was lucky enough to be sent a gorgeous I See Me! book and plush toy to review and we were both thrilled when they arrived. 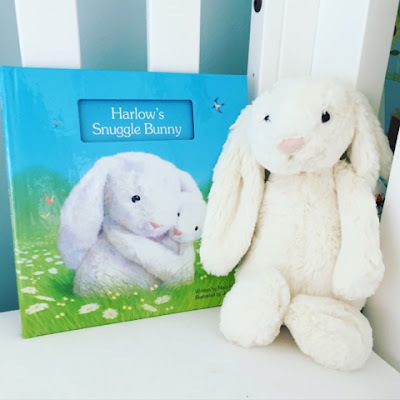 My Snuggle Bunny Gift Set comprises of a gorgeous personalised Snuggle Bunny book complete with a super soft quality plush Jellycat toy. 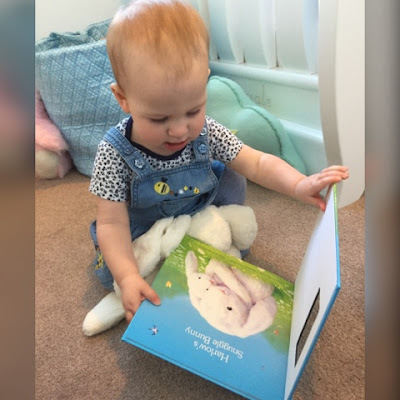 The Snuggle Bunny book can be fully personalised with your child's name in the title (i.e. 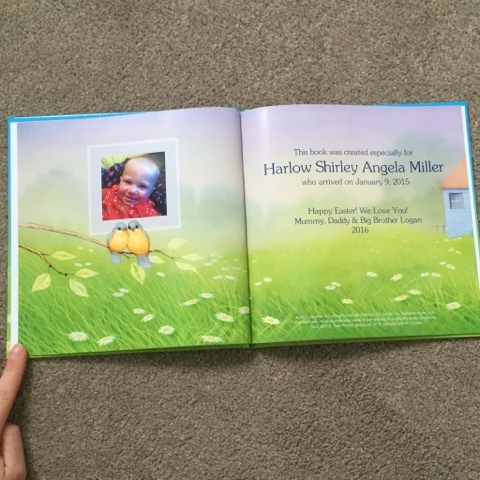 Harlow's Snuggle Bunny), throughout the book, and when you open onto the dedication page you can add your child's photo plus a special message. I chose a Happy Easter message for Harlow since this is a perfect Easter present. Who needs chocolate when you have a gorgeous book with your name all over it and a cute fluffy bunny. Inside the book is a count from 1 to 10 of all the special ways that Snuggle Bunny loves your child throughout the day. As an example number 1 is one hug in the morning and number 8 is eight snuggles in bed. The illustrations (by John Butler) which accompany the beautifully written story are simply stunning. They make this loving book even better and completely match the soft plush toy you receive with the gift set. 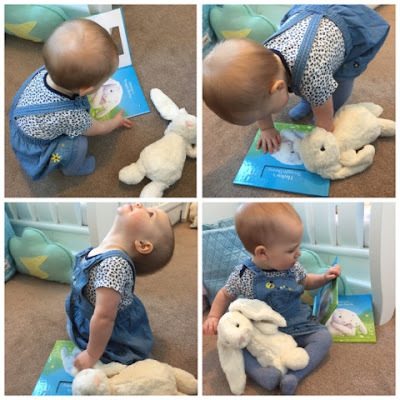 As you can see Harlow thoroughly enjoyed her Snuggle Bunny book and soft toy. It's a suitable book for her age too since the words are kept to a minimum on each page but the illustrations are colourful and eye catching helping to keep her attention for longer. One great thing is that having the soft toy means you can act out some of the actions from the book such as playing peek-a-boo, spinning the bunny round and of course lots of snuggles. This book and gift set is available directly from www.iseeme.com with a shipping cost of £6.50 and 2 weeks turn around. For the book alone it costs $29.99 which is around £21.50 and for the gift set (which includes the soft toy) is $44.99 which is around £32.30. This really would make a brilliant gift for any little girl or boy out there and not just for Easter. It'll definitely be treasured for a very long time and if they ever outgrow the story they still have their very own Snuggle Bunny as a keepsake. I was sent the I See Me! Snuggle Bunny Gift Set in return for an honest review. 3 comments on "Review: I See Me! Snuggle Bunny Book"